A higher level of safety is ensured, as the receiver probe is protected by ABS insulation to improve product safety and eliminate the risk of electric shock while improving its sensitivity as much as possible.it can trace wire under live condition of the high-power switch (below 48V). 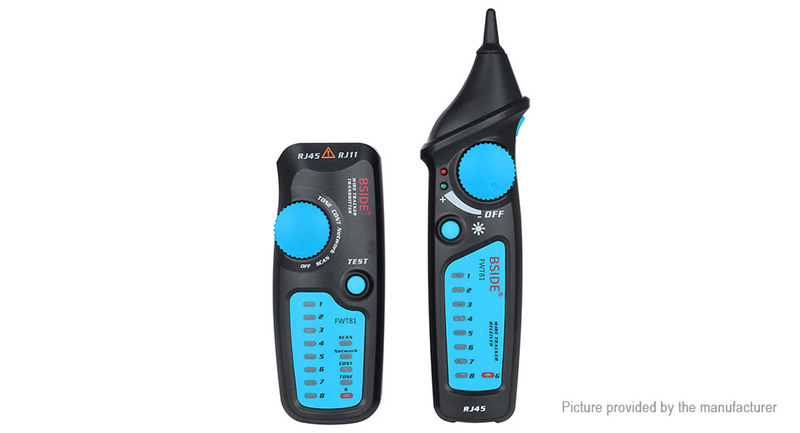 Strong anti-interference, this cable tester can find target cable quickly and accurately in situations where strong and weak electricity is mixed and there are many electromagnetic interferences. Transmitting signal distance: 300m. Low noise: the product emits clear alarm sounds when the target line is found. Intuitive design, with the right and left double turntable design, you can conveniently operate the transmitter and receiver seperately with the left and right hands, without the two equipment affecting each other.With the light touch switch design on the receiver, the received signal can be activated by pressing the switch and be closed by releasing it. The design is very energy efficient as the receiver usually has large power consumption. Suits for wire tracking, network cable collation, status of telephone line test and contunuity checking. Battery undervoltage indicator, this cable tester is a low voltage line-tricking product, therefore, its battery door is designed without screws, which does not affect its safety but makes it easier to replace batteries. Transmitter undervoltage indicator: when the transmitter battery is below the operating voltage, the line-finding indicator on the transmitter flashes, and that’s when the battery should be replaced in time.